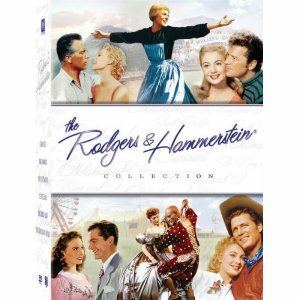 The Rodgers & Hammerstein Collection contains film versions of the five major works by Richard Rodgers and Oscar Hammerstein II, who helped define the American musical landscape and rewrite the direction of musical theater. After enjoying extremely successful careers working with others, Rodgers and Hammerstein first teamed up in 1943 for the prairie tale Oklahoma!, with songs including “Oh, What a Beautiful Mornin'” and “People Will Say We’re in Love.” The subsequent 1955 film starred Gordon MacRae and Shirley Jones, who teamed up again for 1956’s Carousel. While that film’s dark nature made it less popular than its predecessor, the score (“If I Loved You,” “You’ll Never Walk Alone”) was Rodgers’s favorite. The King and I (also 1956) featured stage star Yul Brynner as the King of Siam and Deborah Kerr as schoolteacher Anna Leonowens, who must learn Asian customs even as she tries to instill some of her Western ones. The somewhat bloated version of South Pacific (1958) follows two couples during World War II and features standards such as “I’m Gonna Wash That Man Right Outta My Hair” and “Some Enchanted Evening” from stars Mitzi Gaynor and Rossano Brazzi. The last film, The Sound of Music (1965), proved to be the most popular, with Julie Andrews winning the hearts of seven children and their father with her blissful songs. And if the perhaps saccharine music and plot may test the patience of some, there’s no doubt that songs such as “My Favorite Things” and “Climb Ev’ry Mountain” have charmed audiences around the world for decades. Accompanying the Big 5 in this set is the relatively minor State Fair from 1945 (though it does have “It Might as Well Be Spring” and “It’s a Grand Night for Singing”). Some may expect and prefer other entries in the R&H canon such asFlower Drum Song or the television production Cinderella, but those were produced by different studios.